يقع كراون بلازا وسط الحدائق الاستوائية المورقة، وعلى بعد 500 متر فقط من شاطئ سيرفرز باراديس، كما تضم جميع الغرف شرفة مفروشة وتوفر معظمها إطلالات على المحيط. تضم جميع الغرف الواسعة حمام رخامي كبير وميني بار ومكتب للعمل، كما يتوفر تكييف وتلفزيون مع قنوات الكابل. تشمل المرافق مسبحين مع سبا وتراس شمسي، بالإضافة إلى مركز للياقة البدنية وملعب للتنس، كما تتوفر خدمة الغرف على مدار الساعة. يضم الفندق بارين و5 مطاعم، ويقع مطعم Four Winds 360 في الطابق الـ26 ويعد المطعم الدوار الوحيد في ولاية كوينزلاند. يقع كراون بلازا سيرفرز بارادايس على بعد دقائق فقط سيرًا على الأقدام من العديد من المطاعم والمحلات التجارية، كما تقع محطة ترام فلوريدا غاردنز خط G أمام عتبة مكان الإقامة مباشرة، حيث تتوفر منها رحلات نقل تصل إلى قلب سيرفرز بارادايس أو برودبيتش في غضون دقيقتين، ويقع كازينو Star Gold Coast على بعد أقل من 2 كم، في حين يبعد عالم البحار مسافة 10 دقائق بالسيارة. يرجى الملاحظة بأنه قد يتم تطبيق سياسات مختلفة وتكاليف إضافية على الضيوف الإضافيين وذلك بالنسبة للأسعار الشاملة لوجبة الإفطار. يرجى الملاحظة بأنه يتم احتساب تكاليف بنسبة 1.5% عند الدفع ببطاقات الائتمان. يرجى الملاحظة بأنه يتم خصم تكلفة مواقف السيارات بحسب كل ساعة، ويرجى الاتصال بمكان الإقامة باستخدام بيانات الاتصال الواردة في رسالة تأكيد الحجز للحصول على مزيد من المعلومات. سيطلب من الضيوف عند تسجيل الوصول إظهار بطاقة هوية تحتوي على صورة شخصية وبطاقة ائتمان. يرجى ملاحظة أن جميع الطلبات الخاصة ستكون رهنًا بالتوافر وقد تستلزم تكاليف إضافية. This hotel is well located, clean, comfortable beds, old but well maintainedined carpet. Average soap and hair shampoo. Older style flat screen, but good sized tv. No USB charger ports. Reasonable free WIFI capable of lowcast streaming. Breakfast was included in our stay and was a mix of Australian and Asian foods. It was acceptable but I would not pay for it, as better deals can be found in town. As we are reviewing hotels this week for our customer feeds in beach bum mode, this hotel failed in service social status test. Some staff were exceptional, but the overall feeling was that we were not as important as those well dressed. A hotel (Voco) by the same group left this property for dead in exceptional service. This in mind I would stay here again for convenience and good weekly rates. Love the natural brightness in the room. Size of bathroom and shower space also fantastic. Love the view and the service too. Also love the Laundry room being next to the gym, although gym can do with a better location with some outdoor view. Can improve with a steam/sauna room. That'll make this hotel more updated. Will definitely be back! This was our fouth stay in 2 years and it was disappointing. The facility is ageing... I wouldn't recommend the outragiously priced menu. Bacon like cardboard, poorly cooked eggs, no fresh fruit juice in spite of the advertising (the juicer broke down several weeks ago but was not replaced or repaired...). The swimming pool could use a bit of attention: more comfortable chairs for instance, another set of stairs to access the water, a bit of service by the pool side, cleaning the small tables, making towels available near the pool, not picked up from the concierge, and more... 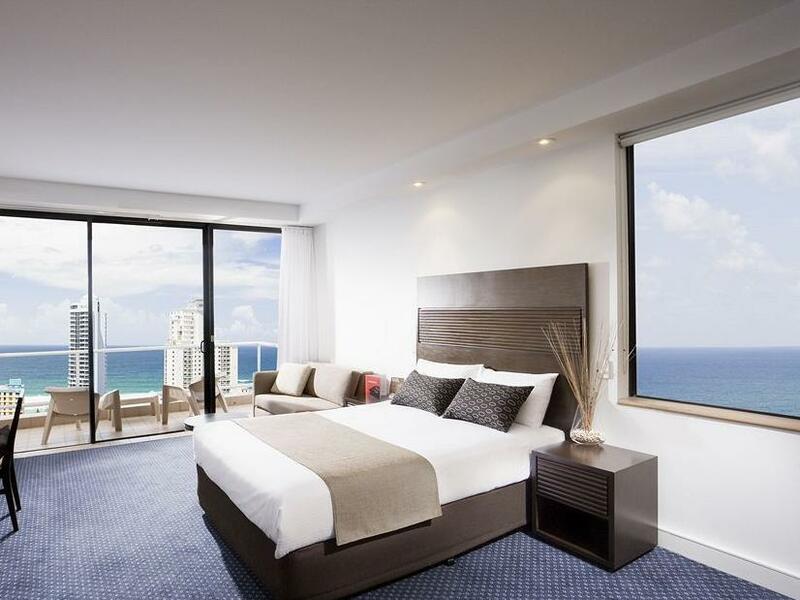 The staff is acutely aware of the hotel's shortfalls and tries to make up for it by responding quickly to complaints, but the fixing doesn't come naturally and it is a bit annoying to have to complain constantly. So yes I would still recommend this hotel but one needs to be aware of its limitations. We really like this hotel. The staff are nice, the breakfast is great. And it’s a comfortable place to stay for a reasonable price. However, the rooms are a bit dated (even in the Gold Tower) and they forgot to service ours during our stay. A few maintenance issues that should be looked at as well, our toaster didn’t work and the fridge leaked water from the freezer. I did inform staff at check out because how can they know if no one tells them? Overall it’s a nice place, we will stay again for sure. 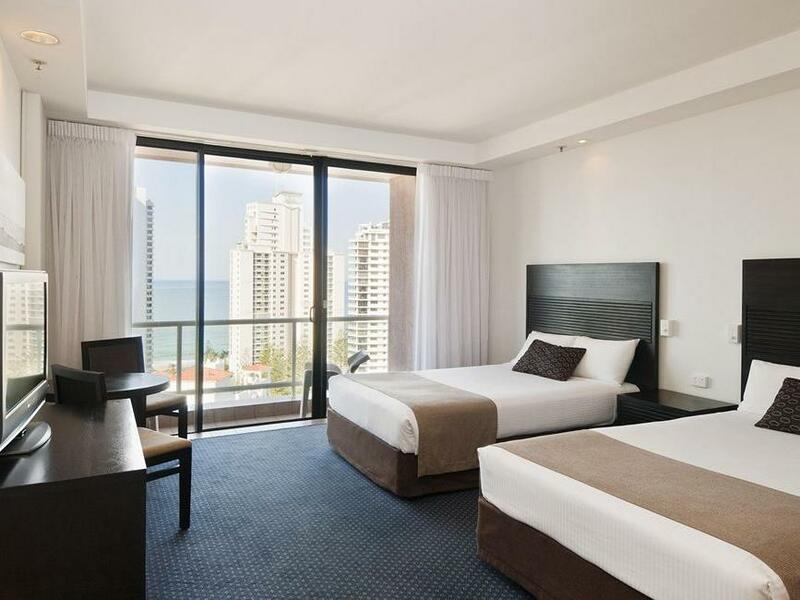 We stayed here to go to Dracula's it's very close to the new tram and also most eating places and bars at Broadbeach North 3 minutes by tram. We went to Dracuals then the Star Casino, decided on a taxi back which was really quite cheap $10.80 ...really nice taxi guy,, we did not use Uber . Check in was relatively quick and simple with the staff being attentive. Asked for a high floor and they gave us a room upgrade. The room and bathroom is plenty big enough, and this had a balcony, but its pretty cosy out there. Pretty comfy bed and the usual entertainment. Lots of pay films to choose from, but at either $7 or $8 each (even for older films), not great value compared to other hotels. Good location and convenient parking available for your car. $15 a day, a bit steep considering you are already paying to stop there. 1 large Swimming pool seemed very quiet during our stay. Plenty of sun loungers but no padded covers. The breakfast was good and service fine. Overall, enjoyable, not expensive, and would stay there again. Breathtaking sight from the room's balcony. Excellent & personnalized welcome by staff. Great helpfull concierge. Luxurious swimming pool. We were just impressed by the staff's kindness and the special attentions given to us. There is only good things to say about our stay. It is remotely located from the city center but close enough to walk there. Thanks. 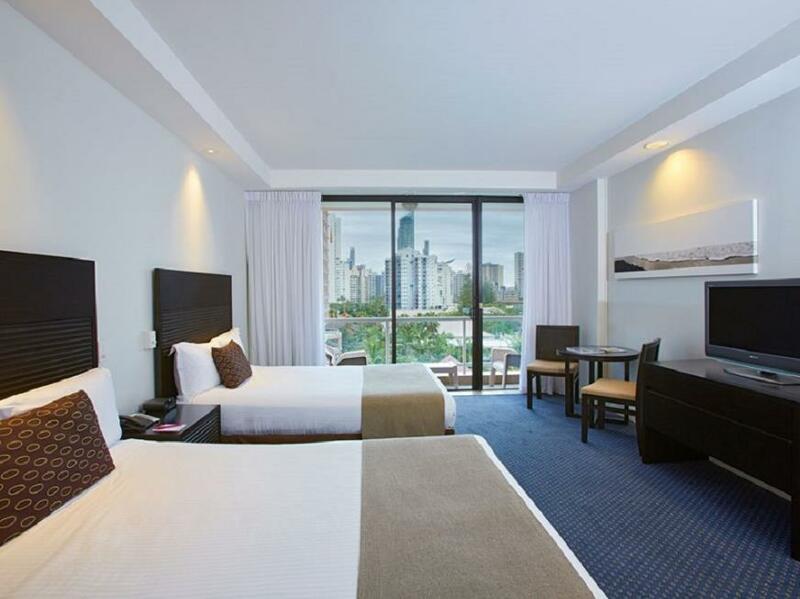 Beautiful, large rooms, clean and friendly staff. Overall a great experience. The Crown met all our expectations associated with a name like this with the rooms, food, staff assistance, finishings on the decor and the beach a 3 min walk away. Depending on what type of holiday you want, the location can be a pro or a con. Being 30 mins walk from the centre of all the restaurants and night life can be a downer, but if you only do it once or twic, its a good walk and you would prbably need to walk off dinner afterwards. Overall great hotel, great experience, perfect wheather, but as a young couple we would probably like to be closer to the action next time. good location and very good night view of the the city. 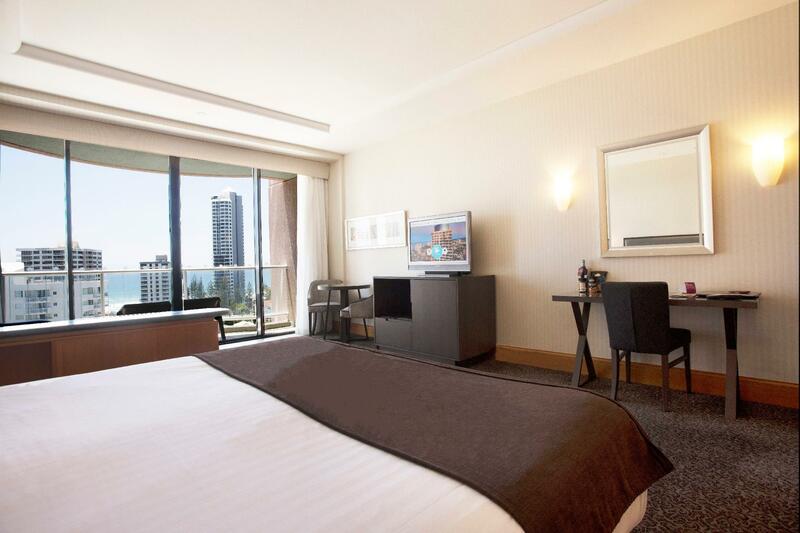 Excellent service and large room. Nice view off the balcony. Basic facilities. Needs a refresh. 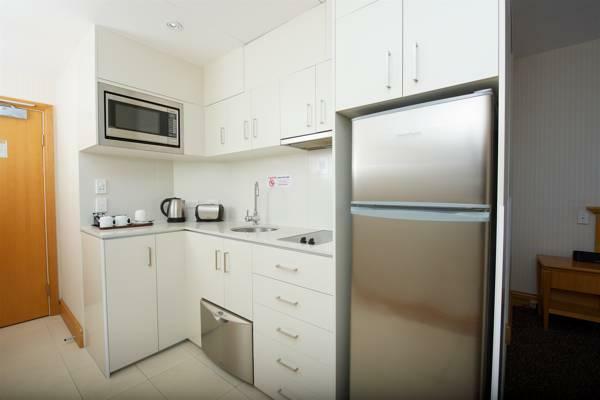 Convenient and easy access to supermarket and eateries. Easy with young children and the room was cosy and comfortable! ALL ARE EXCELLENT BUT I HOPE THE BREAKFAST TIME IS MORE EARLIER THAN 630AM AS MOST OF THE GUESTS WHO ARE HAVING THEIR FLIGHT EARLY WILL NOT HAVE TIME TO HAVE THEIR BREAKFAST BEFORE 6AM. Nice room, very nice bedding but mattress was way to soft and saggy and wasn't great for the back. Spa had previous tenants blond hair left in it. Room otherwise was clean and tidy. Great view on ocean side. 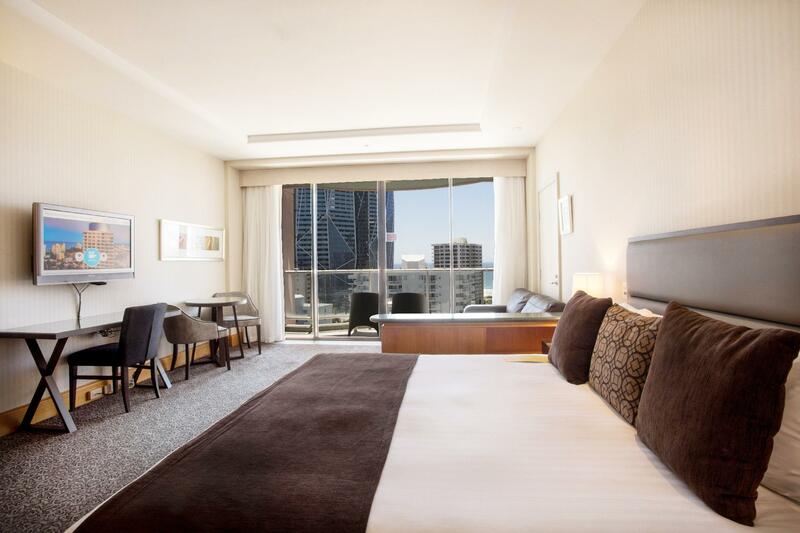 I stayed here for a long weekend recently and was pleasantly surprised - after traveling to the Gold Coast many times. The service was superb, offering free wifi, paper delivery and even late check out. The rooms were well presented with a fully stocked mini bar and snacks. The view was breathtaking. 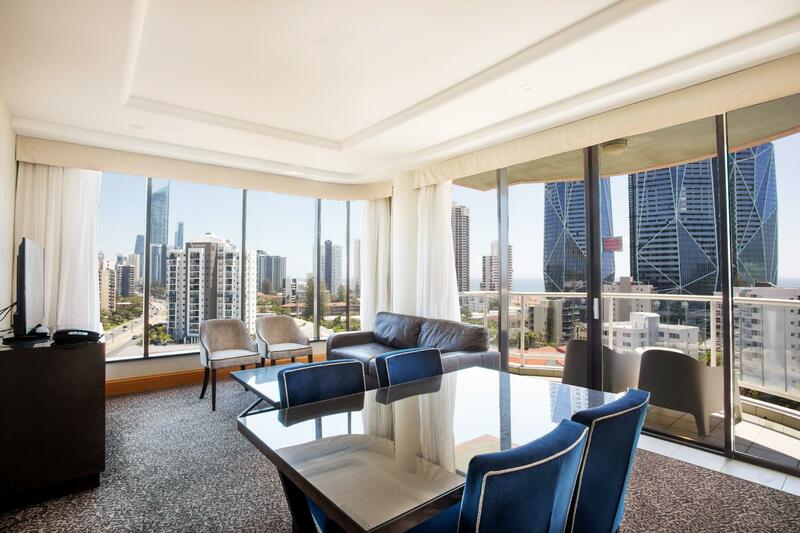 There are many newer and swankier placed popping up all over the Gold Coast now (and I have stayed in a few of them) but I will be going back to Crowne Plaza without hesitation. Great value for money!! When we arrived, checkin was prompt and our room was amazing! The view was even better. The revolving restaurant was great to dine at and room service was awesome. The location was great making it was so easy to go places. It was an amazing way to spend my anniversary. It was a only a one-night stay for my family. The ocean view we had from the room on a high floor was great! Location was also very convienent with a light rail stop located right in front of the hotel. Both Surfers Paradise and Pacific Fair Mall were only 4 short stops either way! Front desk service was excellent and so was housekeeping and Conceirge! Requests for travel adapter, dental kits and printing of documents were promptly met and acceded to with smiles and efficiency!